The third generation Bentley Continental GT was revealed last night. In contrast to the second generation car which was a facelift model in essence, the third actually makes some significant changes. It’s longer, with tighter body work which is quite clearly inspired by the stunning Bentley EXP 10 Speed 6 concept from 2015. The Continental GT has been the definitive luxury Grand Tourer since it first hit the market in 2003. Designed and engineered in Britain, it has opulence and refinement unlike any other car in its segment. For the 2018 model, Bentley have refined the interior, exterior and delivered an enhanced version of their now iconic 6.0 litre W12 engine. Outside, both the front and rear sit lower to the tarmac with styling very similar to that of the EXP projects of recent years. Bentley retained the dual light set up and iconic matrix grille. The huge air vents also remain at the front while the fender gills have been repositioned further down the bodywork. The wheels are further forward and the bonnet is longer. Shorter front overhangs give a better weight distribution. The old Continental GT had 56:44 front to rear while the new car gets a more balanced 53:47. Unladen weight distribution is 55:45 compared with 58:42 for the outgoing model. The aluminium bodywork shaves 85kg from the outgoing model with total weight down to 2,250 kg from 2,320 kg. From launch, the 2018 Bentley Continental GT will feature an all-new version of Bentley’s 6.0-litre, twin-turbocharged W12 TSI engine. For the first time, it will be available as standard with a dual-clutch eight-speed transmission. 635 PS and 900 Nm of torque are controlled by a complex ECU system which makes 300 million calculations per second. 0 to 100 km/h is dispatched in 3.7 seconds with a top speed of 333 km/h (207 mph). 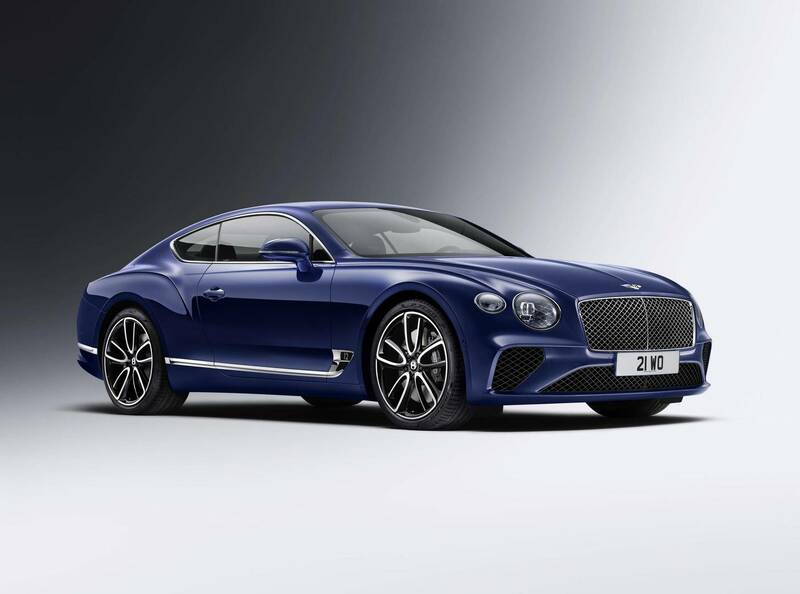 The 2018 Bentley Continental sits on the Porsche MSB platform which underpins the new Panamera. Despite the family connection, 82% of the parts are unique to the Continental GT. It gets an active all-wheel drive system which varied the front to rear torque split depending on the situation. Carried over from the Bentayga, the Continental GT uses the critically acclaimed 48-volt Dynamic Ride System. 21 inch wheels are standard, while 22 inch options are also available. 17 exterior paint options are available with a limited extended range for launch and a bespoke option for those that need something truly special. Inside, the Continental GT still seats four with improved luggage capacity and further refined interior materials. The new Continental GT showcases a completely new dashboard which uses a fully digital, driver-focused instrument panel and rotating display incorporating a 12.3” touchscreen. The touchscreen is well hidden with traditional analogue dials creating that classic Bentley style. The new Continental GT will make its debut at the IAA Frankfurt Motor Show 2017. We will of course be there to bring you live photos and exclusive details!